No one does moody Tasmanian landscapes & seascapes quite like Geoff Dyer. 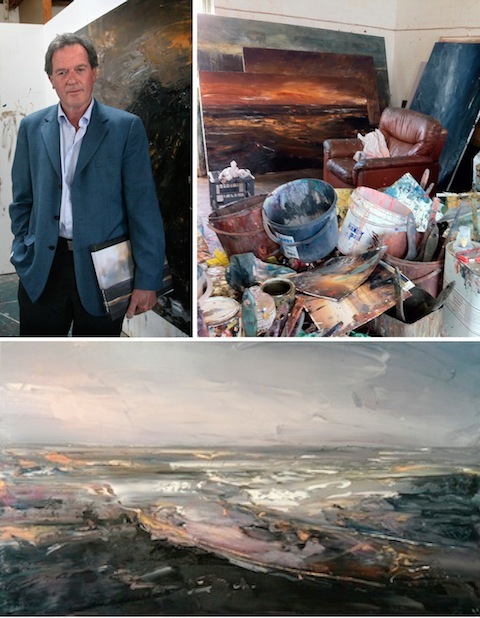 Susie Burge meets the award-winning painter on his home turf. Geoff Dyer picks me up from my hotel in a battered old green BMW, ashtray overflowing, cigarette ash drifting in the air. His weathered face cracks into a roguish grin. We arrive at his studio, in an old brewery. Unlocking the door, he apologises for the mess. I don’t mind mess, I respond (this is true). “This is where it happens!” he announces with a self-deprecating flourish. 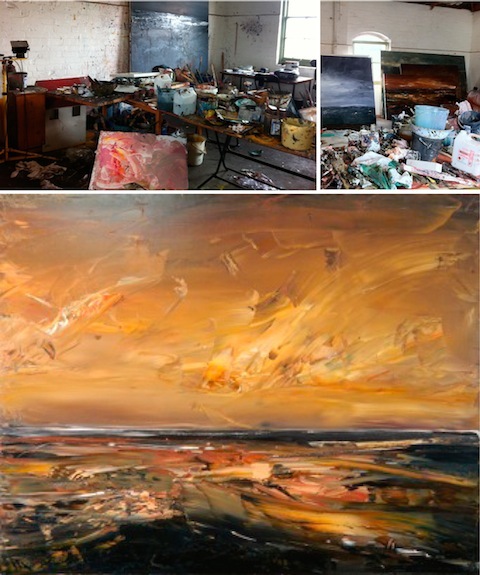 I enter an artist’s studio from central casting: paint-splattered raw floor, worn leather club chairs, canvasses stacked and propped, buckets, rags, tubes, brushes, papers, boots – everything crusted in oil paint. It’s situated in a turn-of-the-century building with exposed rafters and unrendered rough-painted brick walls. The windows are original, arched and flooded with pale Hobart light. “I’ve been here ten years – all the other studios I’ve had have never lasted more than two – I feel like I’m (really) painting here,” he says. We wander around, looking. Dyer warns me to watch my feet (it’s tricky not to step on something covered in paint!) He shifts canvasses, brings those hidden behind others out into the open, leans them up against walls. Grandly expressive, dramatic, serene; some are more beautiful than others, seascapes hovering on the brink of abstraction like late Turners, testament to his enduring fascination with light, oil paint and the natural world. Dyer has spent years inspired by the Tasmanian wilderness and the spectacular, changeable southern skies, the Gordon & King Rivers, the Midlands, the South East Coast, Mt Wellington, the islands of Bass Strait, the ocean and bays. The paintings filling the studio are ready to be shipped to Sydney for exhibition at Paddington’s new MiCK Gallery. Dyer uses colour to sublime effect, but – for me - he’s a master of shades of grey, from the industrial to the tenebrous. 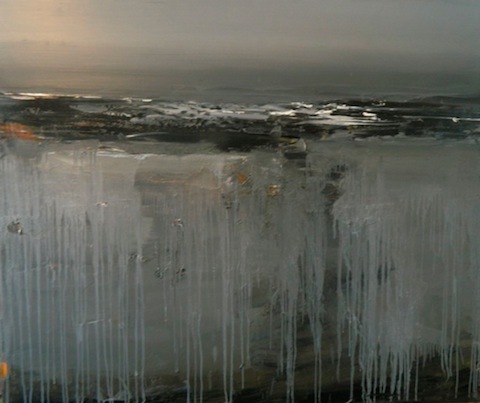 In my favourite picture, the paint dribbles and drifts in the expansive foreground like milky rain, anchored by hard, bright chips of white on a brutal horizon. It’s one of a suite of Ocean Beach paintings. “I don’t like to be too bland with names and I don’t like to be too bloody clever either,” he grins. Finalist nine times in Australia’s most prestigious prize for landscape, the Wynne, Dyer has also been hung in the Archibald Prize ten times, winning the gong in 2003 with a portrait of writer – and good mate – Richard Flanagan. In 2011 he was again represented with a brilliant portrait of MONA’s David Walsh. Primarily a landscape painter, he does one portrait a year, as a rule, specifically for the Archibald. “ I’ve got a bit hooked on it,” he admits. Caspar David Freidrich, J.M.W. Turner, Frances Bacon, Antoni Tapies, Jackson Pollock, Anselm Kiefer, Gerhardt Richter … these are all influences. 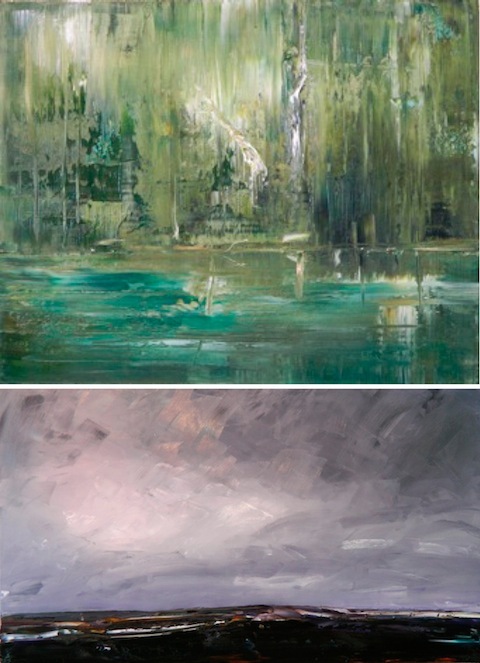 Dyer draws on a tradition of Australian landscape painting – Streeton, Arthur Boyd, Fred Williams – and, more locally, Tasmanian Romanticism with its roots in the Sublime, magnificent vistas tinged with ghostly echoes of a convict past, aboriginal genocide and the destruction of the natural world.